First cut a 6" x 9 1/2" piece of Stampin' Up! Blackberry Bliss card stock and fold it in half for the base, a 4 1/2" x 5 3/4" piece of Stampin' Up! Mossy Meadow for the middle layer and a 4 1/4" x 5 1/2" piece of white for the front layer. 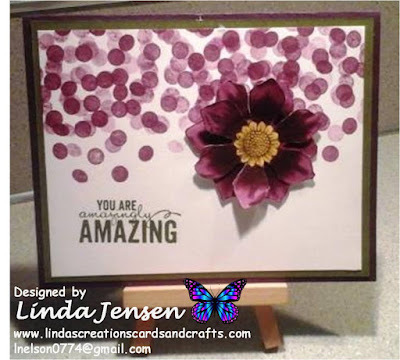 Then create the background, randomly stamp the dots image from the Stampin' Up! Celebrate Today stamp set in Blackberry Bliss ink. Create varying shades by double or triple stamping (apply ink to the stamp, stamp on scrap paper either once or twice before stamping on your project). Next stamp the flower twice on another piece of white card stock in Stazon Jet Black ink. Then color the flowers with Blackberry Bliss and Daffodil Delight ink pads and either a blender pen or aqua painter. Next cut out the flowers with a Stampin' Up! Fun Flower punch, attach them to each other with a mini pop dot then to the background with another mini pop dot. Finally stamp the sentiment with a stamp from the Stampin' Up! 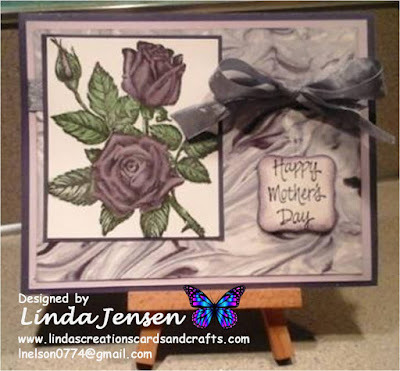 Painted Petals stamp set in Mossy Meadow, attach the front to the middle layer then to the base and enjoy!